Above: Martin Emond photographed by Bevin Rijaart, copyright 2013. Today marks the ninth anniversary of the death of New Zealand comic artist and pop culture icon, Martin Emond. In 2004 at the height of his career, in tragically took his own life. The following is a brief overview of his life and career. His artwork was one of a kind, and he's greatly missed. Above: Switchblade, Martin's most personal creation. Copyright Martin Emond Estate 2013. At the dawn of the new millennium, Martin Emond was poised to become one of the most important new voices in popular culture on the planet. He was based in Los Angeles, where his artwork was in high demand for posters, clothing, movies and television. Disney and MTV were lining up to turn his creations into household names. 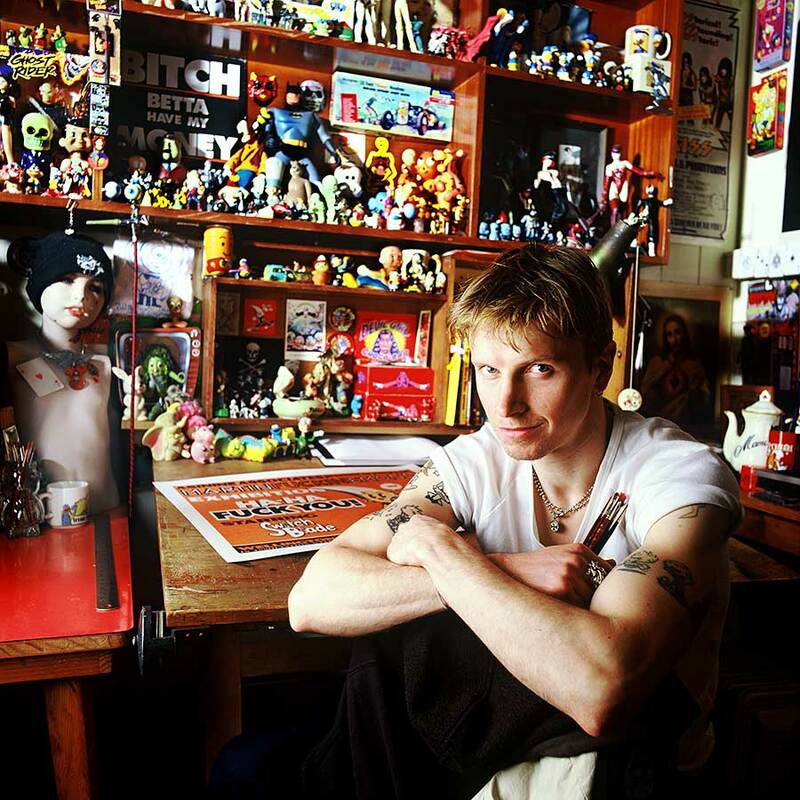 In 2004 he signed a deal to turn his favourite comic strip Switchblade into an animated series, and his other series Rolling Red Knuckles was in production. On the outside he appeared to have it all, but inside he was suffering. A week later, he was dead. Martin F. Emond was born in Scotland, and migrated to New Zealand at an early age, to be raised in South Auckland. Softly spoken and unassuming by nature, it was his artwork that made ‘Marty’ the center of attention in any room he picked up a pencil. At age ten, his Manurewa classroom proudly displayed his renderings of the rock band KISS on their walls. By sixteen he had moved on to British comic serial 2000AD, and discovered his true calling. After finishing school at 16, he attended ATI (now Auckland University of Technology), studying towards a Graphic Design Diploma. He completed two of course’s three years, before dropping out – his refusal to focus on any assignments other than drawing and painting lead to him not being ‘invited’ back to complete his final year. It was probably for the best, as Emond had other plans. He moved to Kawarau and spent a summer working at an abattoir, saving up for a trip to the UK where he planned to meet his idol, artist Simon Bisley. In 1991 he made the trip and ended up staying at Bisley house, learning the tools of the trade and quickly found work on the short-lived anthology Toxic! 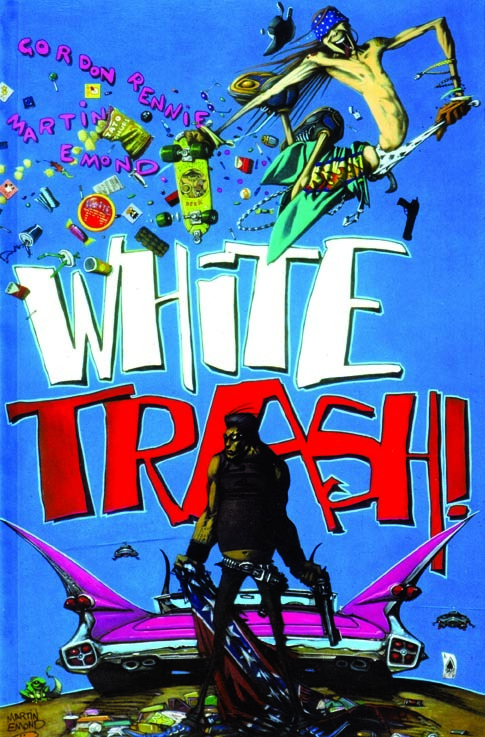 He spent 18 months in the UK before returning to New Zealand with a contact to produce what would become one of his seminal works, the mini-series White Trash, with writer Gordon Rennie. The comic teams up ‘The King’ (an Elvis analogue) with Dean - a teen slacker with more than a passing resemblance to the lead-singer of Emond’s favourite band Guns ‘N Roses - on a hellish road-trip across Southwest America. Emond’s artwork perfectly captured the mayhem and energy of a rock & roll performance, elevating the comic and his career to the next level. In quick succession he produced artwork for 2000AD, Epic and Heavy Metal magazine. In 1992 Emond met US Heavy Metal musician Glen Danzig backstage at one of his concerts in Auckland. Danzig was starting up his own line of comics called Verotik, and would commission Emond to produce the covers. 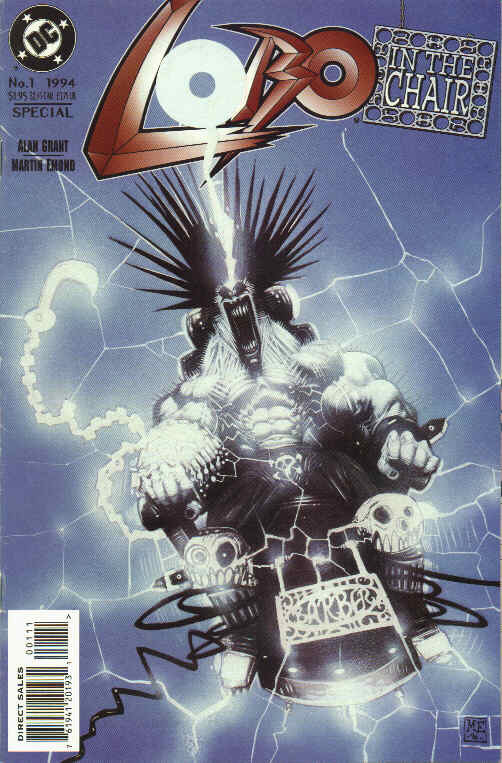 This lead to work for Marvel and DC Comics, including a two year run on Lobo, DC’s popular and irreverent intergalactic bounty hunter. By the late nineties Emond had tired of drawing Danzig’s explicit comics, and moved on to produce artwork for Japanese publisher DDD. He was given an open brief, and developed his first solo creation, Rolling Red Knuckles - a gang of touch-as-nails street girls, which gained a cult following. Locally, he enjoyed producing gig posters and album covers for rock bands like Shihad and Head Like A Hole. Through his studio mate Simon Morse, he became involved as a designer for Steve Hodge’s Auckland-based street wear label Illicit. Emond’s gift for creating designs with a rock & roll sensibility and healthy dose of ironic humour, were an instant hit. Hoodies and t-shirts were branded with Rolling Red Knuckles, and a new character he had created, a cute street-wise orphan called Switchblade. In 2000, Switchblade’s origin was revealed in a series of one page comic strips printed in local music magazine Selector. The cute and instantly iconic characters caught the attention of music labels and Hollywood producers, who were soon courting Emond for the rights to turn his ideas into animated TV shows and live-action movies. In 2002 he moved to Los Angeles, where producers from MTV and Disney were eager to work with him. After many unsuccessful offers, he eventually signed a contract with Interscope Records to turn Switchblade into an animated TV series, but by now his usual enthusiasm and energy was gone. Privately he had confided in friends that throughout his life he wrestled with depression, and the constant meetings and broken Hollywood promises were taking their toll. On March 5, 2004, a week after signing the contract for Switchblade, he took his own life at his L.A. studio. He was 34 years old. Survived by his fiancee Liesje, a memorial was held for him at Alleluya Café in St Kevins Arcade, on Karangahape Rd, Auckland, on March 28. The service was attended by his family, friends, and hundreds of devoted fans. Great article Adrian! I didn't know know of Martin's work before this but he sounds like a great guy and fantastic artist. Sad to hear how it all panned out in the end. Thanks for the overview Adrian! Makes a few things fall into place. Martin did some great work for me on the Judge Dredd Megazine in the early 90s - his depiction of skysurfer Chopper on a Garth Ennis script was just stunning. I was at art school with Marty in the late 80's and we used to party together as well as plan comic works. Martins first commisioned comic piece was Accident Man and he got that gig based on a portfolio piece ("654"?) he did and sent, at my suggestion, to Pat Mills in the UK. I had a very rare copy of that but gave it to one of Martys closest friends after his passing. 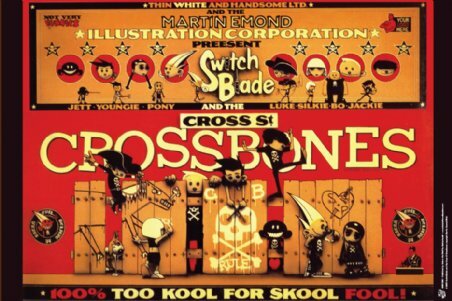 In later years, when he had a studio in downtown Auckland with Simon Morse, Martin was extremely giving with his time and returned to AUT (formerly ATI) to give guest lectures and portfolio discussions to illustration students. I remember he was quite nervous of public speaking but his visits always ran overtime due to Martins generosity. Martin was also present at the first ever NZ comic convention, Iconz (run by Duane Lucas) at the Avondale racecourse and did some live drawing on a Jam strip. His memorial at Allelujiah cafe was indeed attended by many many people including members of Shihad and it was a really cool gesture of respect when they dedicated a song to him when they did their mythic free show in Aotea Square on May 1st 2005. Thanks for this bio - and its neat to learn about the man from these comments too. One of my fave comic artists ever, but so hard to find anything about him. So talented, died so damn young. I became acquainted when he stayed in Japan. He homestay to my house. He was a very good friend. It was delicate and owner of a unique feeling. And was the owner of a very good talent. He was too early to die. His work has been praying to be handed down to future generations. RIP Martin. You are very missed. 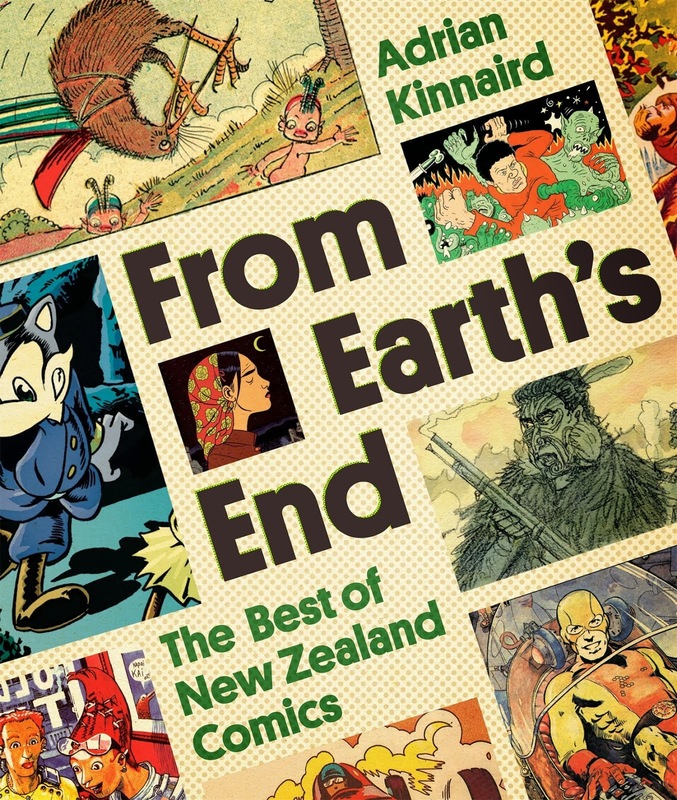 Buy From Earth's End: The Best of New Zealand Comics HERE! Cartoonist, author, opinionated culture vulture.